A Qatar high school student and her father were detained and handcuffed at a New York airport late last month after a new travel ban on visitors from certain countries was put into place. The ban has since been suspended, but caused chaos and confusion at airports around the US for several days. Since then, several stories have come out detailing mistreatment of travelers from the seven-Muslim majority countries on the banned list – Iran, Iraq, Libya, Somalia, Sudan, Syria and Yemen. The teen from Qatar has shared the details of her harrowing experience in a video posted on Youtube. In the video, she introduces herself as Iman Bakir Sudki. The Iraqi national and her parents left Hamad International Airport (HIA) to go to New York’s JFK airport in January, unaware of the new rules. Full of excitement about her trip, Sudki filmed the beginning of her journey, including scenes of her ride to the airport, as well as shopping and getting a manicure at HIA. She continued to film throughout the flight and after the family’s arrival at JFK, but then the screen goes dark. The rest of her experience – being detained at the airport for 26 hours – is narrated through a series of statements written in white text on the screen. Sudki explains that after a long wait at customs, her mother – who is Qatari – is told that she can enter the US. But she must leave her Iraqi husband and daughter behind. Sudki and her father are told they will need to wait more than 12 hours for the next Qatar Airways flight, which will return them to Doha. Her mom opts to wait in the airport with them, but just before the flight is due to take off that evening, she is told to leave. Afterwards, Sudki – a minor – said she was handcuffed and moved to another terminal, before being told that she and her family may not have to fly back to Qatar after all. 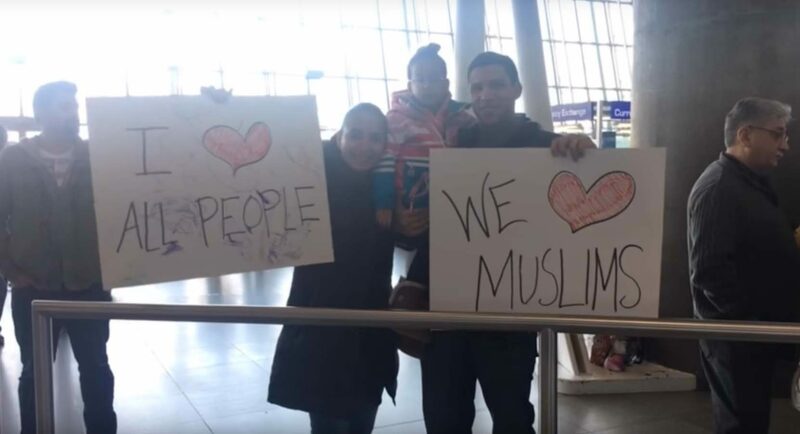 Hours later, the pair are finally told they will be able to enter the US after all, and are greeted by Americans holding supportive placards in the arrivals terminal. It remains unclear why Sudki and her family were reunited. They have not spoken publicly about what happened, and their lawyer did not return a request for comment. But a US firm did file a legal request for Sudki and her father’s release on Jan. 28. Signed by her mother, the document stated that the family had been awarded Diversity Immigrant Visas to enter the US last August. Under that program, 50,000 permanent resident visas are made available each year to people from countries deemed to have low rates of immigration to the US. Thus, the family’s green card status may have helped them enter the US. Many other families were not so lucky, and there have been several reports of other travelers being sent back to HIA. However, the US courts have so far found the travel ban to be unconstitutional so it remains on hold for now. A Qatar resident has spent a year producing a stunning time-lapse video of the desert at Zekreet on the country’s west coast. Croatian expat Vedran Strelar moved to Qatar in 2011, and since then has been a regular visitor to the area, often camping overnight. Zekreet is characterized by limestone “mushrooms” and cliffs, and home to Film City, Zekreet Fort and Richard Serra’s towering “East-West/West-East” sculptures. Strelar said that in order to make the film, he visited the area many times over the course of one year. During each visit, he would put cameras in different locations and set them to take pictures for hours. Many were mounted on rails so that the shot would move very gradually. “For day time-lapses, I was waiting for the days when there were more clouds in the sky. For the night shots, it’s good to avoid light from the moon, therefore I would usually wait for a new moon period, when there is no moonlight so I can get a great view of the Milky Way,” he said. Do you like the video? Thoughts?